It seemed like forever (four full weeks!) to get my headers back but they're here and look very nice! The installation was pretty straight forward. I had to undo both motor mount bolts and the transmission mount so that I could jack up the motor and shift it slightly. No biggie though, I put both headers in place by myself within 15 minutes once the bolts were undone! 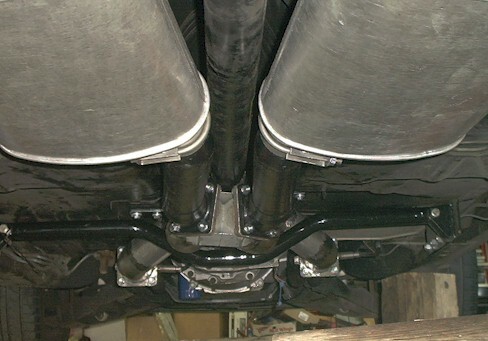 This view shows the ground clearance from the drivers side where you can see how nice and high the tubes are in relation to the oil pan, engine crossmember & lower A-arms. The next big chore was fabricating the balance of the exhaust system. Lots of fabrication (cutting, welding, and grinding) this month! 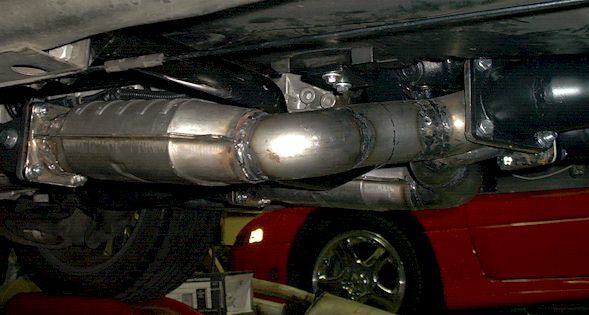 The final exhaust system configuration consists of dual 3.5" exhaust pipe entering the Dr. Gas "X" pipe and then transitioning the pipe to 3" diameter to enter the 3" inlet/outlet DynoMax Super Turbo mufflers and finally the 3" tailpipes. I elected to build the front head pipes mating to the headers with four bolt 3/8" thick flanges matching the 4 hole header collector gaskets and also added flanges behind the "X" pipe so that the whole head pipe assembly could be removed to facilitate easy transmission removal. 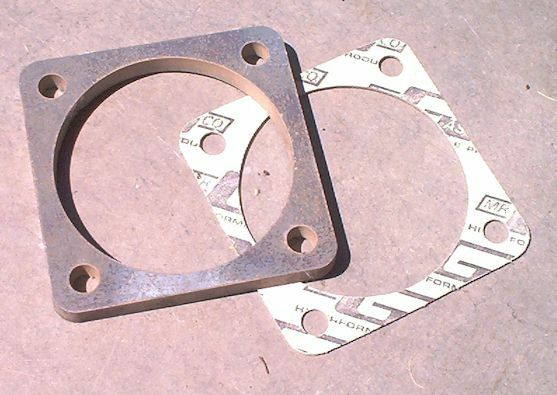 This pic shows how well the flanges came out by using an Abrasive Water Jet to trim them to match the gaskets. 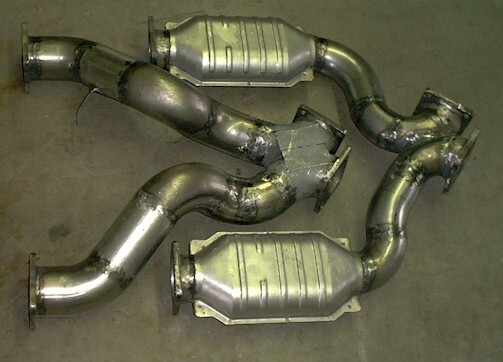 I also need to be able to install the Carsound Catalytic converters for emissions testing so I actually fabricated a 2nd front pipe section in 3" diameter with the CAT's welded in and fabricated my own "X" pipe with rear flanges for easy removal/installation with the 3.5" "off road" head pipe assembly. Before I could start the pipe routing I had to rework my drive shaft loop to clear the huge 3.5" pipes. This is a before/after pic with the original configuration on the left and the final modified version on the right. This view shows the 3.5" head pipe assembly w/"X" pipe transitioning to 3" pipe prior to the mufflers before final installation. Note, the front pipe section has had the welds ground flush since I plan to have this section also ceramic coated to match the headers so that the exterior heat generated will be reduced due to the snug body clearances. 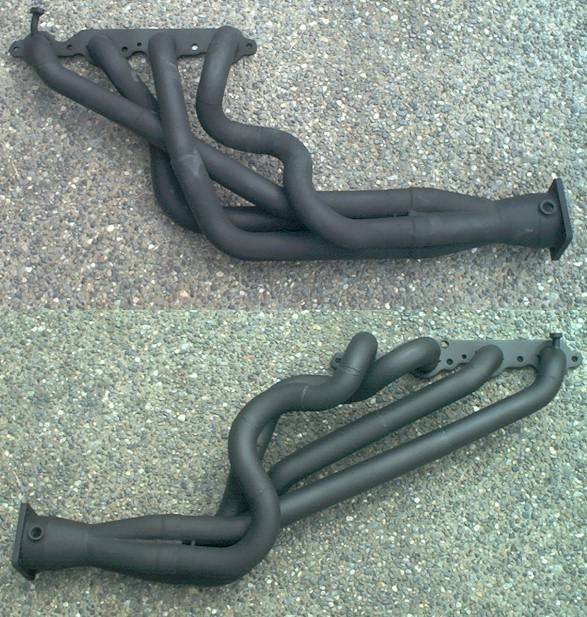 The rear pipes have been painted with high heat paint. I actually routed the 3.5" pipes next to the transmission and the over the crossmember so that the crossmember will protect the pipes and maintain maximum ground clearance. 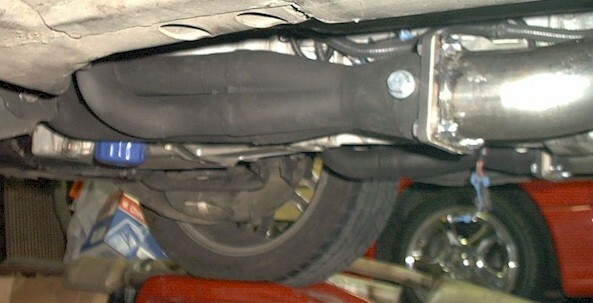 This view shows the 3.5" "off road" head pipe section installed. 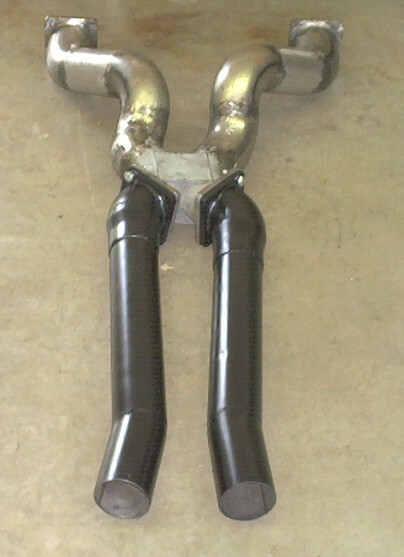 This rear view shows the complete installed exhaust with the 3.5" head pipe. I also welded a tab to the front head pipe which has a 10mm bolt attaching it to a mating trans. 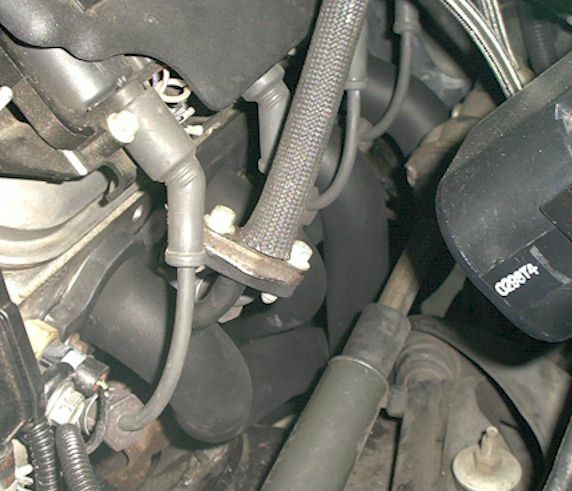 metal tab to minimize pipe travel in relation to the engine/transmission during torque flex. As for the tailpipes, I didn't like the welded on tailpipe hanger tabs at the rear of the tailpipes as provided by Torque Technologies (TT). 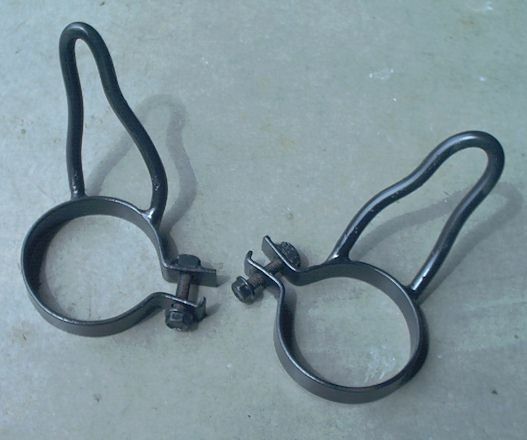 This view shows a side by side comparison between the "as fabricated" pipe hanger tab by TT on the left pic and on the right pic my revised look after cutting their welded tab off, grinding the pipe smooth and painting it. 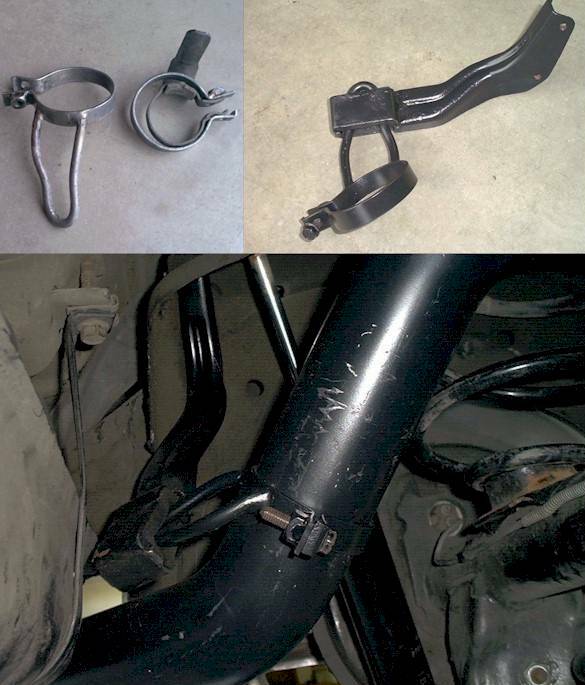 I then fabricated my own "stealth" tailpipe hanger clamps using the OEM Buick GN/TR tailpipe hanger brackets for support just in front of the fuel tank. This view shows my new completed hanger clamps that I fabricated from 3/8" diameter rod, the 1/8"T x 1/2"W bar stock (both bent in a vice! ), and the OEM Monte Carlo hanger clamp weld nut and bolt after paint. This view shows a comparison of my new clamps on the left (prior to paint); the OEM clamps for 2-1/4" pipes and one of my new 3" ones on the right pic; and then on the bottom pic it shows my clamp installed through the drivers side GN/TR painted tailpipe hanger. This wav file is my favorite at a cold idle where the motor is programmed to run a little richer and at a little higher RPM (~1000RPM) and sounds absolutely wicked with the nice tinny sound created by the B1 camshaft loping! This wav file (unfortunately the mic connection was clicking a bit, sorry!) is a casual rowing through the gears shifting at 4000RPM into 2nd, 3500RPM into 3rd and 3000RPM into 4th (using about 1/4 throttle to about 60MPH) recorded again from the passenger seat with the windows down so that you can hear how awesome the combo sounds from the inside of the car with a little bit of engine load. You can just imagine how wicked this sounds on the outside with the behind the rear wheel side exit tailpipes to the typical roadside bystanders :>). And how does it perform? It definitely sets your cheeks back! Expect big results in next months update!! !